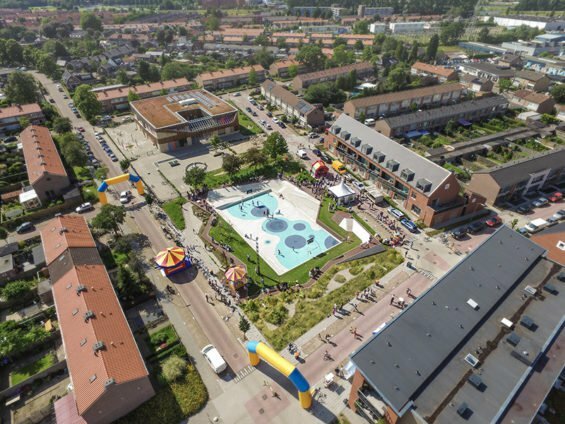 The city of Tiel has to deal with several water related challenges like the risk of flooding, high groundwater and a need for waterstorage. In the “Vogelbuurt” an improvement of the built environment and the public space is smartly combined with solving these water problems. 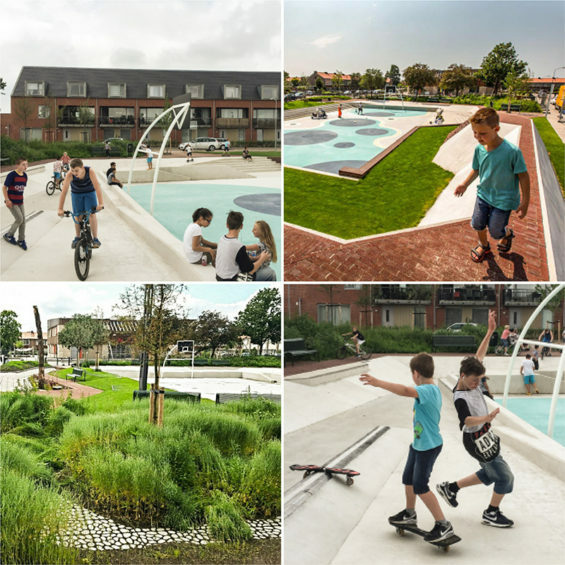 The Urbanisten designed a central water square that has two functions. It had to be both a vivid place to play and linger and a temporary storage of rainwater. They asked us to codesign one of the basins as a place for skating. 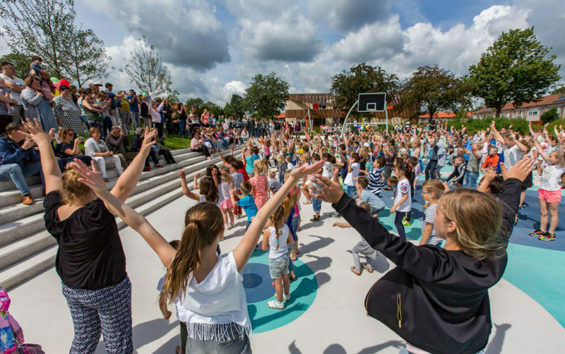 The Urbanisten designed a central water square that has two functions. It had to be both a vivid place to play and linger and a temporary storage of rainwater. 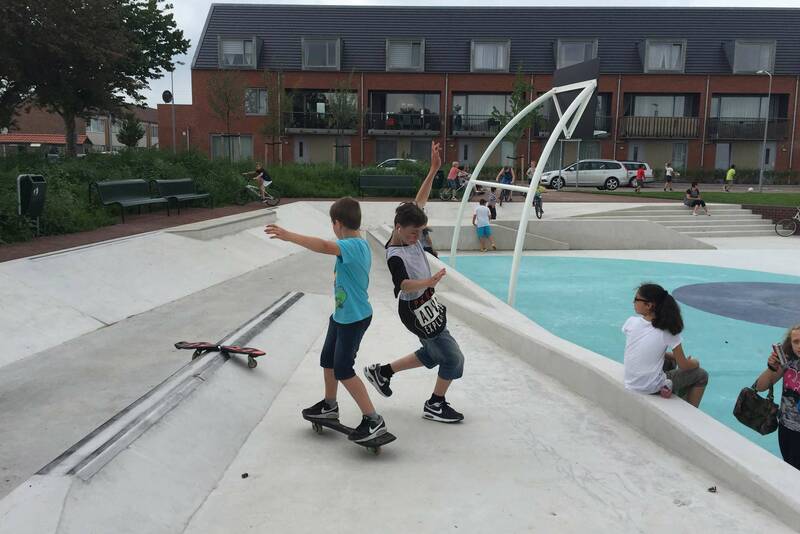 They asked us to codesign one of the basins as a place for skating. In the middle of the square, a sports field is also the largest basin for the storage of rainwater. A ‘playful snake’ curls around the central sportsfield. This landscape with height variations creates a sequence of smaller basins for water transportation, extra water storage and infiltration. 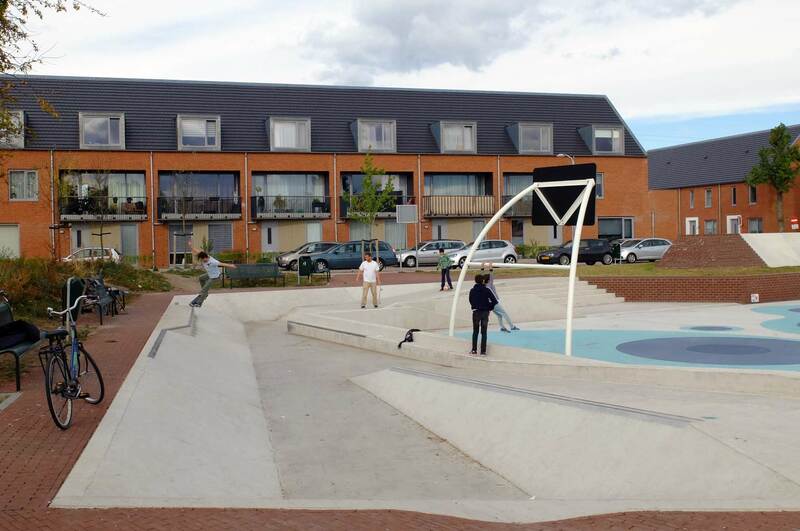 With its various slopes and heights, the landscape invites children and adults to use it for a wide range of activities, although it is designed and robustly detailedas a skatepark in disguise. A generous amount of green surfaces frame this landscape and invite to relax and linger. A ‘playful snake’ curls around the central sportsfield. This landscape with height variations creates a sequence of smaller basins for water transportation, extra water storage and infiltration. 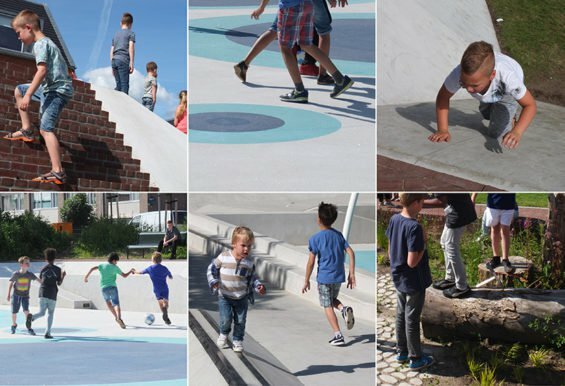 With its various slopes and heights, the landscape invites children and adults to use it for a wide range of activities, although it is designed and robustly detailed as a skatepark in disguise. In the design process, children from the adjacent school participated. They created their own snake by cutting and pasting their favorite activities for the square. 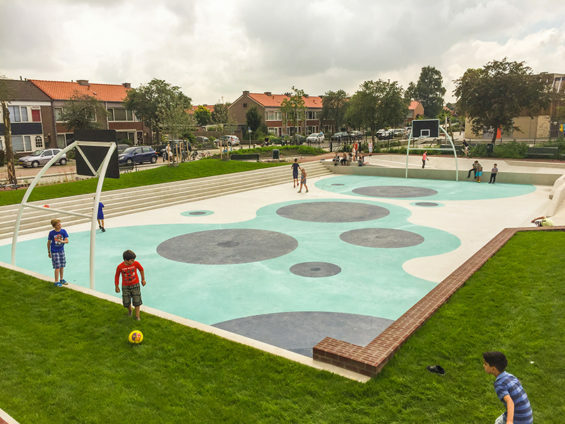 With their preferences, we gave all parts of the landscape a different shape and possible use: a natural playscape, an archipelago playground, a skatebasin and a sportsfield. With a regular rainfall, only water from the school is brought to the small basins where it can infiltrate, thanks to a raingarden and permeable paving. The central basin only floods during extreme cloudbursts or longer periods of extreme rainfall. It is filled with rainwater from the water sewage of the surrounding streets. It’s also the overflow for the undeep basins. Ultimately, when the stress period is over, the water is conducted back to the rainwater sewage system. photography Jan Bouwhuis, images courtesy of De Urbanisten.